And then I frogged a bunch of stuff to re-claim the yarn. On the left, seven hanks of Cascade 220 reclaimed from that intarsia bag that I never felted. 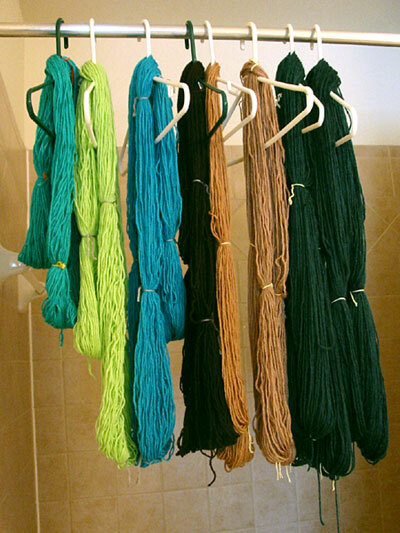 Then some tan Cascade 220 reclaimed from a large swatch. And finally, some Mission Falls 1824 wool superwash rescued from a sweater my brother was knitting (and mostly completed) but never finished due to fit and construction issues. I also started a hat project. About five times because I kept changing my mind about the design of the hat. Ribbing or no? Two-by-two ribbing or one-by-one? Long tail or tubular cast-on? I thought the sixth time would take, but it turns out that the hat is sized to fit a basketball, not a human head. Riiiiiiiiiiiip. 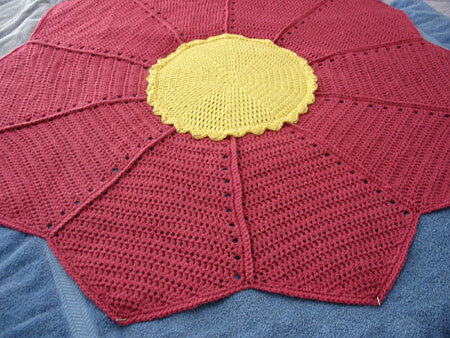 CogKnition posted this on August 30th, 2009 @ 12:48am in Crochet, Unfinished Objects, Yarn | Permalink to "Two Steps Forward, Three Steps Back"
The blanket turned out great!